Union Saloon is the kind of bar you wish was in your neighborhood. Late on a Sunday afternoon, I sat at the handsome horseshoe-shaped bar that anchors Union Saloon, Wallingford's newest neighborhood bar. With its heavy wooden door, antique objects, oversize booths, shiplap walls, and exposed wood-beam ceiling, the space evokes nostalgia for the taverns of the Wild West, the creaky hulls of grand ships. I sipped an old-fashioned (cocktails here are of the classic, straight-shooting, two-to-three-ingredient variety) and dipped salty triangles of golden fried pita bread into a luscious spread of smoked sturgeon rillettes ($13)—tangy with crème fraîche, bright with lemon, lively with fresh dill—until the plate was clean. Given the day's (and every day's, it seems) news, I thought about how Union Saloon's nostalgia won't be pleasant to everyone: The "settling" of the American West and long journeys in the hull of a ship conjure up very different images depending on who you are. Luckily, Union Saloon's warm service and stellar, thoughtful comfort food were more than enough to distract me from thinking about the state of our country for too long, even offering an unexpected bit of hope. A summer green bean salad ($11)—a tangle of still-crunchy wax and broad beans, verdant and pale yellow—was thrilling, beefed up with crispy wedges of fried potatoes and laid atop an herby and tart mayonnaise-like sauce gribiche. Black peppercorn chitarra ($18), delicate strands of handmade pasta bathed in a buttery sauce as rich as it was light, got a summery boost from ribbons of zucchini. Maitake mushrooms added earthy heft, and guanciale gave a bit of racy, meaty funk. A pork-cheek sandwich ($15), one of four sandwiches that make up the heart of the saloon's menu, remains the most satisfying dish I've had in months. 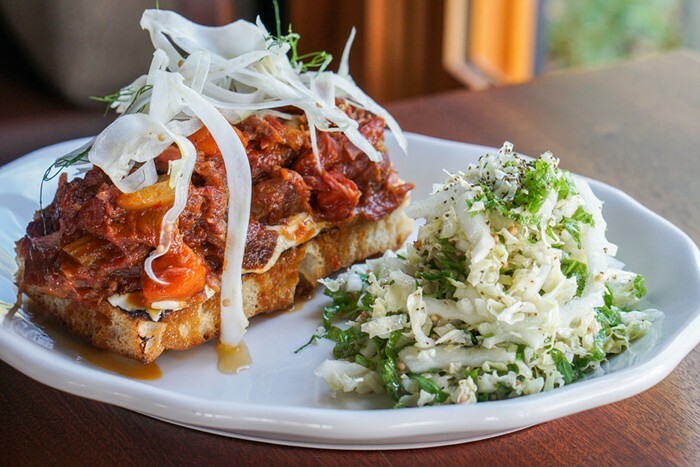 It's as decadent as it is restrained: an open-faced sandwich on house-made focaccia slathered with mayonnaise and topped with a mountain of silky pork meat, braised so long that it's become one with the tomatoes and chilies with which it was cooked. The freshness of a shaved fennel salad with pickled mustard seeds and the acidity of a napa cabbage slaw held the dish at the intersection of too much and just right. Japanese elements are scattered throughout chef Blake King's dishes: maitakes, bonito flakes on a Caesar salad, fried chicken with togarashi, the napa slaw served alongside sandwiches. King is obviously a student of the cuisine, but he doesn't flaunt it. He uses the ingredients sparingly, amplifying flavors and creating unexpected twists. A multicultural perspective is woven into his culinary vision, as subtle as it is undeniable. A long, low bookshelf topped with old cast-iron objects lines Union Saloon's front windows, and a few cookbook titles hint at the kitchen's inspirations: Salumi; Japanese Farm Food; Terrines, Pâtés & Galantines. But the bare shelves long for more books and items, from places far afield. And the barstools and booths, occupied mostly by denizens of the immediate neighborhood, cry out for a more diverse crowd of people from all over the city. The food is certainly worth the trip. Union Saloon was designed to feel comfortable and well-worn from its inception. I look forward to seeing how it ages and grows.